Hello and thanks for waiting.  The 2017 Paramore Year-End Voting is now open. Vote once per day in each category. Voting ends on 5th of January 2018 at 7pm UK time. Open worldwide! *festival setlists are not included. *based on countries Paramore didn’t visit on tour in 2017 but visited on tours in the past. Hello and thanks for waiting. Sum up 2017. Vote on your favourite Paramore new song, favourite music video, favourite TV/radio performance. Choose the best tour of the year, news of the year and tell us who runs the best Paramore fanbase on social media. More categories to be revealed in November. Join us, follow on Facebook for updates and remember, Paramore is at least Hayley, Zac and Taylor! General voting is now closed. The results will be announced in a specail video on PARAMORE TV YouTube Channel around 10th of January. A list of Ambassadors. THANK YOU FOR ALL YOUR VOTES! !